Wherever you go in the world, you can wear a little piece of Oregon with a piece of sunstone jewelry. "It's been found in other parts of the world - Russia and Norway - but only in Oregon was it found to be gem quality," says Bruce Moore. Moore is a partner in Desert Sun Mining and Gems and Woodmoore & Gray Jewelers, which carries a variety of jewelry, including sunstone. The gem comes in colors ranging from orange, pink, salmon, light red, green and, very rarely, blue. "Oregon" is the only place (where the sunstone) has the copper inclusions that gives it a shimmer, a flash, a warmth," Moore says. "It's why they call it sunstone." Special Interest: The store specializes in sunstones, which can be sold loose or in classic settings by jewelry designer Anthony Crimini. Rarity: "It's an all-natural stone. 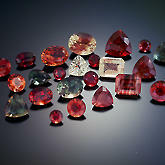 You can't heat treat it or radiate it to intensify the color like you can with other gemstones. That can make it difficult if you are trying to match stones for a bracelet. But a lot of people, that appeals to them." Didja know? In 1987, sunstone was named Oregon's official gemstone in a proclamation by Gov. Neil Goldschmidt. Or this? Sunstones are dug in open mines in Southeast Oregon. The largest mine is new Burns. "Sunstone is found in lava flows, so it can be hard mining," Moore says. "It's hard digging." Jewelry prices: At Woodmoore & Gray, you'll pay $100 for stud earrings to $200 for a pendant to $350 to $900 for a ring. Prices are dependent not only on the stone, but also the metals and workmanship of the setting. What else should readers know: "We're very nice people," Moore says.